Itasca Garage Door Repair | Overhead Garage Door Inc. Overhead Garage Door Inc. is a certified dealer of Clopay Garage Doors. Through Clopay Garage Doors, our Itasca customers are able to custom select from a wide variety of garage doors that best suit their needs. At Overhead Garage Door Inc., we guarantee we will find the perfect garage door for you Itasca home at an incredible value. Overhead Garage Door Inc. is a leader in the garage door industry. We are masters at matching, selecting, installing and maintaining your garage door. 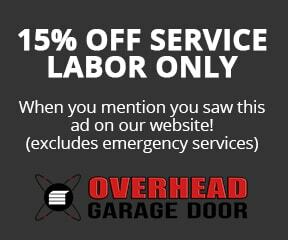 Overhead Garage Door Inc. provides Itasca customers with a service that cannot be beat. If you have an old garage door that needs to be replaced or your garage has experienced some kind of serious damage, our Itasca garage professionals are able to fix your garage door so it’s looking good as new. Don’t settle for a worn-down malfunctioning garage door, have your Itasca home looking new and call the experienced garage technicians today at Overhead Garage Door Inc.